Apple has long been rumored to have an interest in the virtual reality market, but the company itself has always remained quiet on the technology. That’s not an unusual strategy for Apple, though, as it often only makes very general, or even negative, comments about a technology until it is ready to announce its own foray into a market. During the company’s earnings call for the first quarter of 2016, however, CEO Tim Cook was asked about his opinions on virtual reality. Apple has made a variety of acquisitions relating to the virtual and augmented reality technologies. Earlier this year, it acquired a company called Emotient. Emotient used artificial intelligence to detect emotions by analyzing facial expressions. In a similar fashion, the company also recently acquired Faceshift, the company behind the motion capture technology used in Star Wars. The acquisitions of Faceshift and Emotient combined present a few intriguing possibilities. Ben Lovejoy broke down a handful of them earlier, but some of it bares repeating again, especially taking into account the acquisition of Emotient. Perhaps the most interesting possibility in my opinion comes in facial recognition to unlock devices. I don’t think this has a huge use case for iPhones, but for Apple TV and Mac it’s a different story. Impinge that, as soon as you sat down in front of your TV, Apple was able to recognize that it was you and propagated your Apple TV with your personalized content, including apps, TV, music, and movie suggestions, and more. This would make it much easier for families to share Apple TVs without having content overlap. The same principle applies to the Mac. You sit down in front of your Mac and your personalized user account is automatically loaded without you having to enter a password or anything. Personally, I don’t think facial recognition for device unlocking has as big of an application for the iPhone. With Touch ID already as quick as it is and with iPhones not being devices that are commonly shared by more than one user, it just doesn’t seem realistic for Apple to invest too much time into implanting facial recognition into the iPhone. On the other hand, facial recognition could be used on the iPhone to identify the people in a picture on the go. Imagine that as you’re taking a picture, iOS is able to immediately identify who else is in the picture and tag. You could even set it up so that if you took a picture with a family member, iOS could recognize who it was and immediately share it with them via AirDrop. This would replace the age-old process of taking an image on everyone’s phone or taking an image and iMessaging it to the other people in it. Currently on the market there a variety of headsets that enable virtual reality from existing smartphones. Perhaps most notable is Google Cardboard. Just as the name implies, it’s a literal cardboard structure with a slot for a smartphone that gives virtual reality-like experiences. There’s also the Facebook-owned Oculus Rift that’s launching later this year. I don’t necessarily see Apple entering the market of developing its own virtual reality headsets, however, but rather creating platform on which other companies can build virtual reality headsets and apps. Think something similar to HomeKit and TVKit platforms that Apple offers. Apple has yet to build its own hardware for things like iPhone-controlled thermostats and lights, but rather a platform on which other companies can build their hardware and integrate it with iOS. For instance, look at the Speck Pocket VR headset that was announced at CES earlier this month. 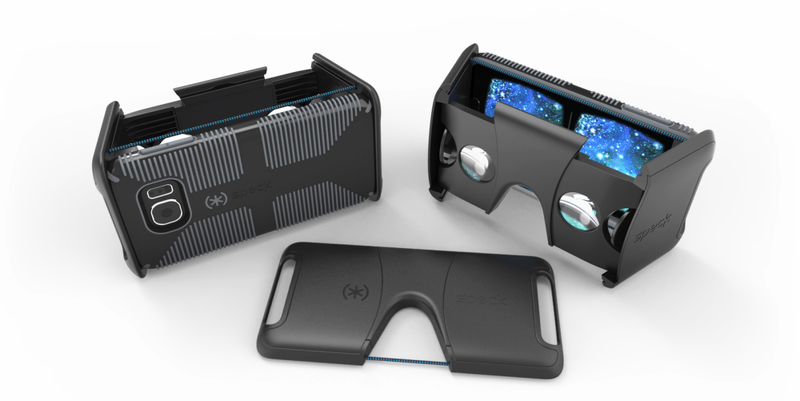 The Pocket VR features a collapsible design and is compatible with the iPhone 6 and iPhone 6s and gives iOS users a Google Cardboard-like experience. The issue at the moment with things like the Speck Pocket VR, though, is that there is not a lot of content available on iOS for the platform. So if Apple were to release a VRKit of some sort for developers, they could build virtual reality apps for third-party viewers like the Speck model. Along with VRKit, Apple could apply its Made For iPhone (MFi) standard to VR headsets, as well, allowing companies to work in conjunction with Apple on bringing virtual reality to more people, without Apple itself having to invest too much time or effort into the technology. If Apple were to build its own virtual reality hardware, which I think is very unlikely for the foreseeable future, there is no part of me that thinks it will be anything that resembles Google Glass. Google Glass arguably proved that the average person doesn’t want a piece of hardware to attached to their face at all times. Apple’s solution should be something focused on gaming rather than delivering 24/7 information. That’s what the Apple Watch is for. At the same time, however, Google Glass and Google Cardboard have proved that there is a huge market for virtual reality in enterprise markets. For instance, earlier this month we saw Google Cardboard used to save the life of a young child with heart and lung issues. With Apple already pushing its iPad and Mac lineup in the enterprise market with its IBM partnership, there are a handful of different ways in which it could partner with hospitals and the like to implement virtual reality technology. In 2012, Apple was granted a patent for a technology relating to 3D camera technologies related to augmented reality. The patent detailed how the camera would be capable of recognizing facial expressions and gestures while creating 3D models of scanned objects. This technology would lend itself very nicely to a Project Tango-like technology. Furthermore, a patent application recently surfaced suggesting that the company was considering a twin-camera system for future iOS devices. A two-camera set-up opens up a wide array of possibilities when it comes to augmented reality. Perhaps most telling about Apple’s augmented reality plans is its acquisition of Metaio last year. Metaio specialized in integrating augmented reality into every day life. For instance, the company opened the door for virtually trying on clothing. The technology in the video below was created using Metaio’s SDK and shows how augmented reality can be used in viewing historical landmarks as they looked hundreds of years ago. No matter how you look at it, virtual and augmented reality are becoming more common technologies with every passing year. Now that Apple has officially acknowledged its interest in the market, it will be interesting to see where it goes. As I mentioned before, I don’t see Apple getting into the hardware-side of virtual reality anytime soon, but rather creating a platform for others to develop their own apps and hardware for. Personally, however, I think that the most interesting possibility for Apple is in integrating augmented reality technologies into the iPhone camera. Imagine being able to hold your camera up and using just your iPhone, be able to map out a place in real time, adding layers and making changes. What do you think Apple has in store for virtual reality? Let us know in the comments!